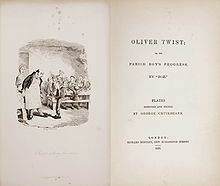 Oliver Twist; or, The Parish Boy's Progress (1838) is Charles Dickens's second novel. It was first published as a book by Richard Bentley in 1838. It tells the story of an orphan boy and his adventures among London's slums. Oliver is captured by, and forced to work among, pickpockets and thieves until redeemed by a gentleman who has taken an interest in him. Characters include Fagin, Nancy, Bill Sykes, and the Artful Dodger. The book is one of the earliest examples of the social novel. It draws the reader's attention to evils such as child labour, the recruitment of children as criminals, and the presence of street children. The novel may have been inspired by the story of Robert Blincoe, an orphan whose account of hardships as a child labourer in a cotton mill was widely read in the 1830s. It is likely that Dickens's own early youth as a child labourer contributed to the story's development. The book influenced American writer Horatio Alger, Jr. and his stories of poor boys living on the streets of nineteenth-century New York City. The book has been adapted to a popular musical play called Oliver! and several movies, notably a 1948 production starring Alec Guiness as Fagin. A Disney animated feature about alley cats called Oliver & Company has also been released. This page was last changed on 13 August 2018, at 04:28.